If you have a beloved pet that has been a part of your family for years, you may be concerned about how your pet will be taken care of after you pass away. Some clients assume they can simply include a provision in their last will and testament that leaves money to their pet. The problem is that pets cannot own or inherit property. However, our attorneys can help you with estate planning for pets. This way, you can include the necessary provisions for your pet in your estate plan and feel secure that your beloved family pet will be cared for after your death. The first step is to make sure that you provide sufficient funds to provide for the care of your pet. Since pets cannot own property, you cannot leave money for them in your will. Instead, you will need to designate someone to care for your pet and then provide enough funds to cover the costs. How much you need to set aside for your pet will depend on many factors such as the lifestyle your pet may be used to and the amount of money you anticipate will be left in your estate that can be designated for this purpose. In addition to providing sufficient funds to cover the costs of caring for your pet, you need to decide who will be responsible for caring for your pet. When you are selecting a caregiver for your pet, the key is to choose someone who you believe will be reliable. 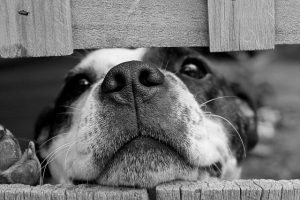 There are many private organizations that provide care to pets after their owners have passed away. But, if you choose an individual, be sure that person will agree to take on the responsibility of caring for your pet when the time comes. Whichever way you decide to go, you must discuss your plans for the care of your pet with your chosen caregiver ahead of time. Another option is to designate an agency that will be responsible for finding someone to adopt your pet. This agency can be identified in your last will and testament. What many people do not realize is that even by creating these provisions in your last will and testament, your chosen caregiver is not legally bound to care for your pet. All the last will and testament can do is identify who will inherit your pet. In reality, the person you choose could ultimately decide not to keep the pet but keep the funds you set aside. For this reason, it is important that you carefully select your caregiver. 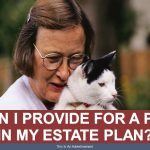 This is one part of estate planning for pets that can be difficult. If you are having a difficult time selecting someone you can rely on to follow through with your wishes voluntarily, then there is a more legally binding option that you can consider in your estate planning for pets. Pet trusts are a special type of trust that you can use to leave your pet to your chosen caregiver along with sufficient financial resources. The trust creates a legal obligation to use the assets for the pet’s care. If the caregiver does not follow the instructions included in the trust agreement, they can be held legally liable for violating those terms. Compared to provisions in your last will and testament, a pet trust can be more complicated and more expensive. But it can also be more reassuring. Since your pet is considered property and, therefore, simply part of your estate, if you do not have a plan in place your pet will be given to your residuary beneficiary. That is the person who is entitled to receive the remainder of your estate when all specific bequests have been made. If you do not have a last will and testament, then that person will depend on the laws of intestate succession in your state. Join us for a free seminar today! 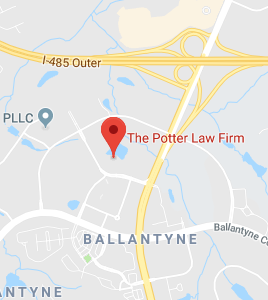 If you have questions regarding estate planning for pets or any other estate planning matters, please contact the experienced attorneys at The Potter Law Firm for a consultation. You can contact us either online or by calling us at (704) 944-3245 (Huntersville or Charlotte, NC) or for individuals in Kentucky at (606) 324-5516 (Ashland, KY) or at (859) 372-6655 (Florence, KY).